I'll admit it, we ran this post last year, but it's so good, I had to run it again. 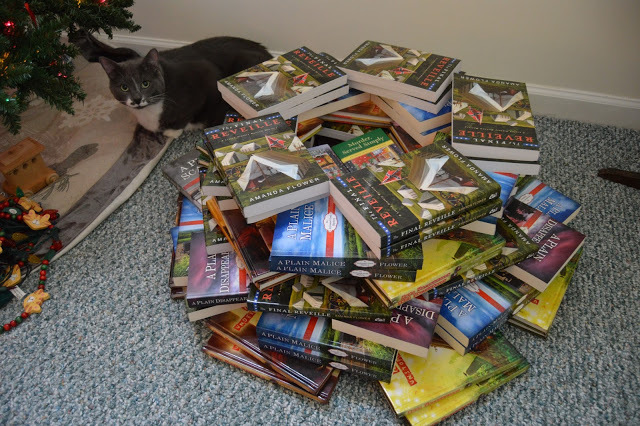 Because who doesn't want to know how to make a Christmas tree completely out of books? Librarian and author extraordinaire has perfected the technique and she's shared it with us. Amanda has been a frequent Mystery Playground contributor on everything from Drinks with Reads to Amish Christmas Traditions and instructions for pin cushion jars. She has a series set in a magical bookshop, two wonderful series of Amish mysteries, a civil war enactment mystery series and a children's series - many of which you can see stacked in the tree above. You can read our review of her latest book, Prose and Cons here. And now let's make that tree.